This is why Jesus will perform a very important act on the Cross: he will open our “hearing” and our “speech” (capacity to talk), so we become, for the first time capable of hearing the Word of God directly and talking to God directly and personally. Note: For these reasons Mary is considered by Luke to be the only one who was capable of Listening to the Word of God and obey it, put it into practice. This is why we need her, New Eve, our Mother, to generate our new heart, in the image of her heart, capable of listening and putting into practice Jesus’ Words. The goal is to become “quick to hear”. In order to do so, there are plenty of other operations of our soul (mind and will) that should stop: speaking and being angry. “chatter” could be an expression of anger. We can’t in the same time hate somebody and want to listen to Jesus. Because “hating” is an act of inner silent speech, where with our thoughts we direct the arrows of our anger against this person. The word of Jesus doesn’t have a space in us. St James will clarify his thought: “anger” is for him any “filthiness and rank growth of wickedness”. If we want to receive the “implanted Word” of Jesus, we need to put away all what goes against it. Remember the thorns in the third soil in the Parable of the Sower. It has thorns that suffocate the Word of Jesus implanted in us. These thorns are all that is against the Word of God, all the desires that are not “the desire of God” (richness, worries,…). One of the characteristics of the heart that can receive the word of God is the heart that from the beginning is ready to put it into practice, unconditionally ready for this. We know that God can fulfil any Word he would say to us. So why are we doubting God? We need to trust him, trust that he knows what is best for us today, we are his children, his dearest children and he wants to “save our souls” with his Word. Being in front of Jesus is being in front of THE Truth, the truth about us. We expose ourselves to His Light. Wanting to listen to Jesus means that we want to see ourselves in Him: he sheds a light a day on us, reflects it to us, shows it to us. 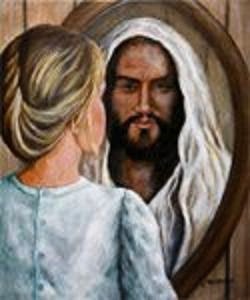 “For if any one is a hearer of the word and not a doer, he is like a man who observes his natural face in a mirror” (James 1:23). Who are the most vulnerable persons on earth according to the biblical tradition? The persons that have nobody on earth to take care of them? The orphans and the widows. These are the most “poor” persons. Before reaching them, we need to open ourselves up to the people closest to us, followed afterwards by our going deeper and deeper into Jesus’ Body until we reach the poorest of the poor: “Religion that is pure and undefiled before God and the Father is this: to visit orphans and widows in their affliction, and to keep oneself unstained from the world.” (James 1:27) “Religion” is worship, is to love God, is all the acts of worship. Giving what we have, who we are, letting the love of God flow from him, through our heart to the poor, Jesus’ body, is really one of the deepest and most powerful ways of “putting into practice” Jesus’ Word: Lectio Divina. We really need to meditate upon these few verses of St James’ letter, in order to deepen our understanding of Lectio Divina.